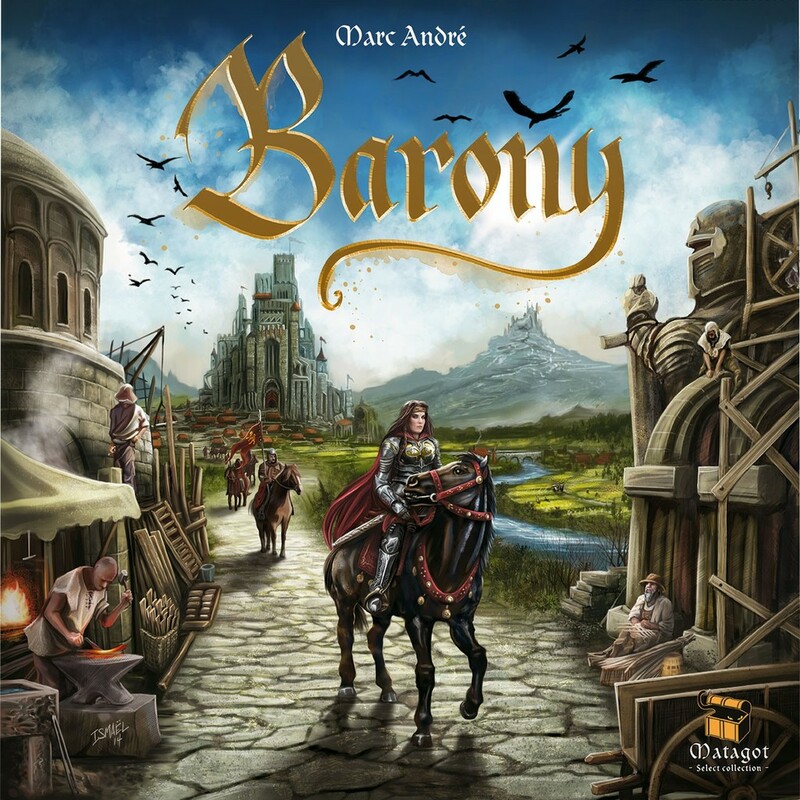 At its core Barony is really an abstract strategy game with a medieval theme pasted on. Or rather, I would presume that is what many would say. Some of the best games out there distil a theme to its most abstracted level. Some call these games theme-less, but to me it is always about how the game makes me feel. If the game makes me feel like I am walking through a desert in its mechanics then I don’t need any amount of flavour text or in-game personas to feel like I am playing the theme. Read on and find out how much theme I got out of this game and how it plays. Is it a new abstract/euro masterpiece? In Barony you begin the game by setting up the game board by randomly placing tiles in a formation that suits you. The bigger the player count, the more tiles are used. Then players in turn place their starting cities and knights. First in player order and then in reverse player order. At this point you will if you are playing a three player game pretty much have settled who will win the game. If you play with more players, there will most likely be more interaction. But in a three player game two players will most likely clash and the third will win. Then you begin manoeuvring your knights around, building villages and cities and fortresses. When you build something you get a victory point token with varying victory points depending on what type of terrain you build on. Each turn the player can take one of five actions: Deploying more knights, removing any number of knights and placing a village or fortresses instead of them, upgrading a village to a city, turning victory points over (more on that later) or removing two knights from the game board to be able to freely place the one any place on the board with the other being removed entirely from the game. Apart from positioning and moving your pieces around and upgrading at the right moment, you also have to manage your points. Your point tokens have two values on them. One that lets you move up on the Barony track, and one that is worth about half the point if you have them at the end of the game without having turned them in. The barony track only upgrades in 15 point steps and whatever points you have left is wasted while paying to move up the track. When a player reaches the last field on the track the game ends immediately. This game leaves me cold. 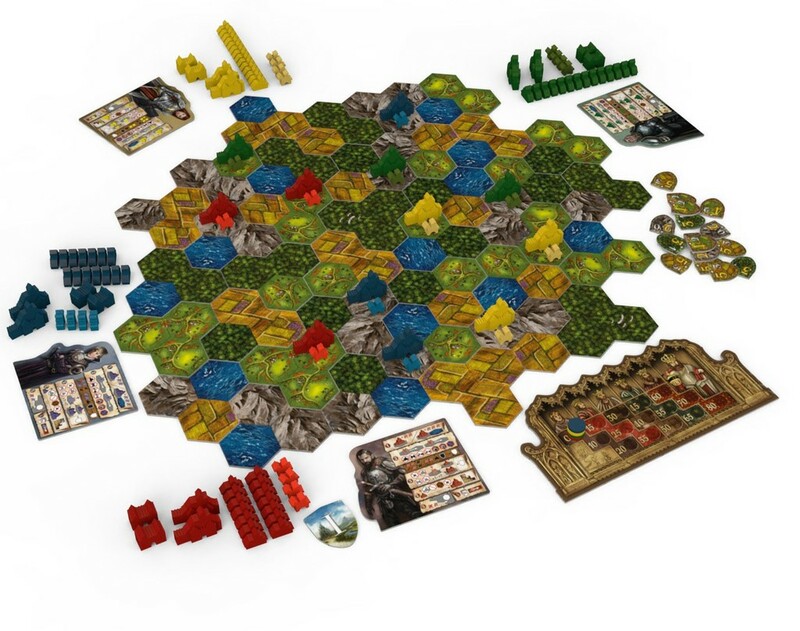 Not only does it have a LOT of kingmaking (kingmaking is where the player who wins gets decided by another player) in the three player game, to the point where there is hardly a point in playing beyond the first three or four turns. I haven’t played it two people, but I can imagine that it would fair a bit better than in the three and four player games I’ve played. With repeated plays there might even be some meat in the game and some ways to avoid the pitfalls of the game being determined at the set-up face of the game. But to warrant many more plays for me, the core game would have to be more interesting. It isn’t. In my intro I mentioned how some games manage to have a very thin theme but still manage to evoke the theme strongly through the feelings the mechanics provoke. I mentioned this because in Barony I didn’t at all feel like I was a medieval mastermind warlord. I felt like I was moving pieces in a game that was almost settled when the first placement actions were over. This game feels like an advanced version of Hey That’s my Fish, with none of the elegance or simplicity that makes Hey That’s My Fish such a great and dynamic game. Check out this review by the Bearded Meeple to see a more visual presentation of how the game plays.